Yes, 70s books here are always better at technical details too! Hi Gina! :-) It's actually Machteld who wrote this post! I have only seen something about the second hand book market in Deventer on TV last weekend! But, next year we are planning to bring it a visit too! However, about the monkey fist knots! Yes Machteld they do resemble the knots on the sides of several medieval purses very closely! I have tried to make several of these knots a couple of years ago. It's not very difficult, it's easier to tie these than to tie a Turk's Head knot. Good luck!! The knot is called, in English: the "Monkey Fist" knot. Also try the search term: "Marlinespike"- it is an awl usd to loosen tight knots in sailing jargon. 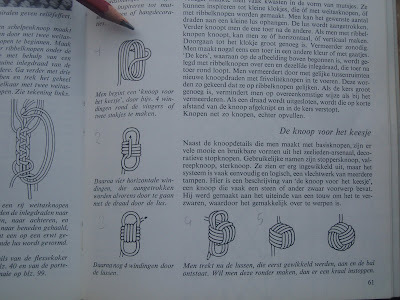 Sailors used to be required to know all manner of knot and macrame for work and also the "doldrums" the no wind periods. 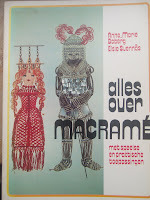 See the boys are into Macrame and Posamenten big time- it just have to involve"camping" or something deemed "not effeminate". Although not strictly period- perhaps these kind of tools could make your work a little more rapid? I am sure workers way back in medieval & renaissance times employed some form of labour/time-saving tools. been occasionally following your blog for a year or so.